A woman in the coffee shop nearly jumps out of her seat. She stares at her “Fitbit“—a recently-popular wristband that vibrates to remind you that you have been sitting down for a little while and need to “START MOVING!” Yes, it’s quite like a shock-collar for humans, aimed at promoting healthy habits via what appears to be generating a fear of sitting down. I had a device quite like that inside my head for a while. It’s called anorexia. Reading any form of media these days is fascinating and worrying at the same time. Skip the first 367,349 pages about the Islamic State and you’ll most probably find something along the lines of “New Fitness Centre Opened to Meet Ever-Increasing Demand” or “New Superfood Discovered” or even “Studies show Social Networking Sites are Motivating Teens to Eat Healthy and Work Out.” Me being me, I have found several anorexia recovery blogs whereby teens go from emaciated to gym junkie/marathon runner in a number of months, and everyone is applauding them. They should be, right? These things appear positive, no? I do not doubt that there are hundreds of people who come out of eating disorders with a genuine interest and love for sport like myself, but reading some of their statements, “before and after transformation” pictures . . . one has to wonder whether they’re doing it out of enjoyment or more for eating-disordered reasons. Now, this is no new news. It’s been happening for a couple of years, but in the last two or so the fitness and “Wholefoods” industries have exploded like some Hawaiian volcano. 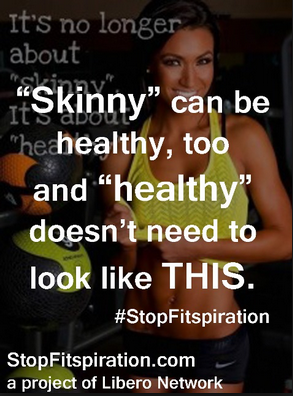 Fitspiration is a trend that involves motivational videos, pictures and/or quotes to encourage people to become fit. It’s everywhere; Facebook, magazines—there are even blogs dedicated to posting the images of fit men and women alongside army-bootcamp-style quotes. Sounds quite healthily motivating, right? The theory is rather flawless, getting people to exercise more and improve their physical wellbeing, but the carrying out of this good intention has only been loosely following this line, now mainly fuelling the world’s bodily insecurities, encouraging the idea that with a good-looking physique, confidence and thus complete happiness follows. That last one really hits hard. It’s a mantra that’s plastered all over the Internet. I believed it for a long time in my recovery. I needed a reason to put on the weight I had to gain to psychologically justify it, so I obsessed over being fit because the world was suddenly back-lashing against the unhealthy thinness of celebrities and members of society. Perhaps there was a way of recovering without feeling bad, and this was it. Or not. “I’m going to be fit and strong, not boney, once I get out of here.” I kept telling my nurses, psychologists—the whole dream team. A majority, as I expected, applauded me. “That’s so good, Lauren. Such a healthy thing to do. Eat clean and be muscly and you’ll be healthy and look great!” My mind buzzed from the praise and the hope that I’d one day feel comfortable in my own skin—but not for long. I recited this to a new nurse, and she frowned.“Do you hear yourself? Repeat what you have just said and think about what you’re saying.” She stared at me like a hawk. I had no idea what I’d done wrong. “I used to want to feel my bones . . . but now I want to—ughh…kind of be . . . muscles?” I questioned. It sounded pretty ridiculous the second time around. It took me a long time to not only comprehend but realise what she had said. But it was true. Last year I came 110th in cross-country, and this year I came 3rd without even trying to, due to my obsessive exercise routine. I felt good about it. Look how much I had “achieved!” People said it was inspiring. 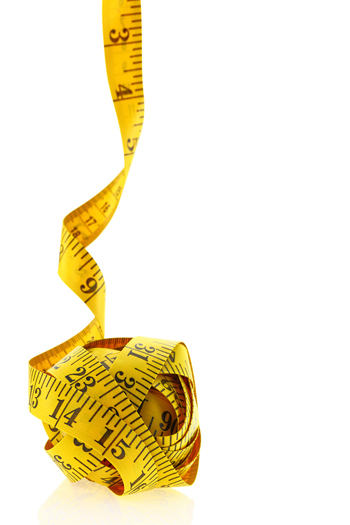 “You’ve certainly got the body for it!” one girl said to me, meanwhile I stood there; a tall girl and only 44 kilos (not even near my lowest weight), dizzy from standing and the bones in my feet jutting into my shoe-soles. I grinned in my own hazy world. There it goes again: the association between fitness and appearance. I knew there was no happiness in losing more weight. I’d done that. I didn’t feel any better. In fact, I had to do yoga on a mattress instead of a mat because my tailbone jutted into the floor like, well, a TAIL. I had to exercise though because of my obsession. I had to eat, because I wanted to be able to run miles that day, otherwise I’d have a panic attack and probably smash my head into several walls (this actually happened loads of times. Would not recommend). My only hope manifested in becoming fit-looking. It meant I didn’t have to gain “fat”; the very thing I feared above all else for no single reason, although society’s fear of it doesn’t much help. At 40kg (less than 90 lbs.) I was doing crunches in my hospital bed, having the tube feed pumping the supplement drink into my stomach. All I could think about was the calories forming a big river inside of me, and that within about ten minutes—via digestion—the floodgate would open and let it all flow out through each of my veins with a massive waterfall “SHHHH” sound. I was terrified because I hadn’t exercised, so the calories couldn’t fill up my worn-out muscles and repair them. Therefore they were, in my mind, storing fat everywhere. To every anorexic person out there: THIS IS A LOAD OF CODSWALLOP. It’s eating-disordered thinking—not reality. I continued doing crunches, obsessively thinking: “Abs abs abs. Muscle, not fat. Muscle, not fat,” and had doctors come and pin me down. “You people don’t know what you’re doing. Here I am, trying to be a healthier person, and you’re stopping me from exercising! Where did you get your master’s degree?” Yes, I was that deluded that I said that, and I’m ashamed. But what I’m more ashamed of is that we live in a world where this kind of idea is embraced. “I force myself to go for a run,” a friend told me last week, and I wanted to shake sense into her. If you’re forcing yourself to go and exercise, that’s unhealthy too. It should be something that sets you free, not cages you up in an obligatory task. “I just want to be ‘fit’-looking. I should do cross-fit or something! Have you seen the bodies on those people? !” I felt like jumping in a rocket ship and blasting myself out of this planet. It’s hard coming out of an obsession that utterly defined you, when everyone around you continues possessing large remnants of the same unhealthy mentality; it’s very triggering and makes you feel like you shouldn’t be abandoning it. I’ve now become grateful though, that I will never be one of these people who feels like they have to go running because they had that little extra for breakfast; because they want their dream body because they can’t accept themselves as they are right now. I wake up in the morning and I want to run because I love seeing how much further I can go; to feel alive; living and breathing. For once in my life, I’m proud of who I am. 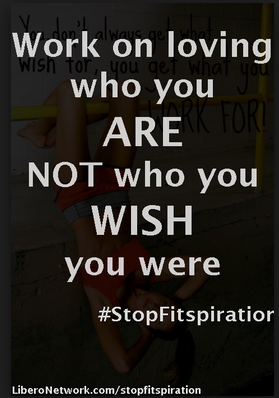 I know that no matter how much leaner, skinnier or prettier fitspiration says I could be if I did what it pressured me to do; it’s not the answer. I know, because I’ve been there; as skinny as I could get without dying; as fit as I could be on four-hour daily workouts and no social life, and I was still unhappy because there was always more weight to lose, more muscles to strengthen, more hours in the day to dedicate to my obsession. . . . Self-respect and happiness lies within how you feel about who you are NOW. One really has to come to terms with the fact that the current moment is all we’ll ever have. I can promise you it’s possible to realise this, and furthermore to appreciate yourself and your body’s capabilities as well as accept its limits. Bottom line? Everywhere, nearly every day, you will be bombarded with some form of fat-shaming, muscle-encouraging, workout-guilting, body-sculpting media marketing to pressure you into doing exercise for inner-reasons that need to be dealt with emotionally and cognitively, rather than just physically. Please think that one over before you embark on your next exercise regime, read the next fat-blasting workout routine in Women’s Health Magazine, create your New Year’s resolutions or bucket list checklist. If exercise is in any of these things: ask yourself why you’re doing it. Is it for you, or your insecurity? You might be surprised at what you discover. Very insightful and an extremely useful series of pointers to eating disorder sufferers underscoring the fact that the council of those with lived experiences carries the hallmark of credibility.